The naturally large European beech hedge is well-known as a towering deciduous tree, but it also can be shaped into a stunning hedge. The tree’s leaves change color with the passing seasons, which make it an attractive hedge in many outdoor spaces. 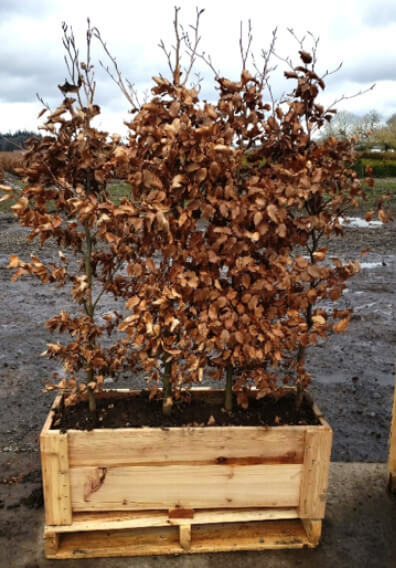 Shorter, 3-4' European beech (Fagus sylvatica) InstantHedge unit ready to ship. Three European beech (Fagus sylvatica) InstantHedge units sit on a pallet ready to be shipped. A 5-6' European beech (Fagus sylvatica) InstantHedge unit put in biodegradable cardboard ready to be planted. Winter row of European beech (Fagus sylvatica). European beech (Fagus sylvatica) foliage in summer. European beech (Fagus sylvatica) foliage in autumn. European beech (Fagus sylvatica) hedgerow in mid-summer. Many hedge units of yew (Taxus) and European beech (Fagus sylvatica) are stages on pallets and ready to ship! As a low-branched beech, with a trunk ranging from 2 to 4 feet in diameter, it works especially well for hedging. The Fagus sylvatica Hedge has a lovely bark that is smooth and silver-gray. The tree’s foliage turns bronze in fall and blooms with yellow-green flowers in the early spring. The male flowers in drooping globular clusters and the female flowers in short spikes, which fruit to edible beechnuts. As a large tree, the Fagus sylvatica Hedge works especially well in expansive outdoor spaces. It has an attractive upright-oval to rounded-spreading crown when left alone and can be pruned to any desired hedge style. No major pest or disease issues. Beech scale is an occasional problem. Borers, beech bark disease, canker and powdery mildew are all possible. Using a beech hedge and arch creates an irresistable entry to the back yard of this cottage. European beech (Fagus sylvatica) creates an effective screen and sound barrier along a busy road. Stone features like this fountain are made more inviting with the use of a leafy hedge like this European beech (Fagus). Even soon after planting, InstantHedges provide elegance and sophistication to a commercial landscape. A European beech (Fagus sylvatica) InstantHedge can make this residential yard much more private and inviting. What a stately, impressive entryway is created with these tall European beech (Fagus sylvatica) hedges lining the driveway. European beech (Fagus sylvatica) is a classic hedge choice that has been used to create beautiful hedges for thousands of years. Between its lush green foliage, lovely fall color, graceful form, leaf retention through winter, and incredible longevity, it has proven itself over time to be one of the best possible hedging choices available. It can be grown into a very large hedge over time, but it can also be kept small and very manageable with regular pruning. It has a low branching habit which makes it perfectly suited for hedging. It is an easy-to-grow hedge that tolerates a wide range of soils and other factors, and it is very cold-hardy. European beech is one of the few popular hedges that can boast a stunning seasonal color change. First, in spring, leaves are fresh, bright green. For summer, they are deep green, smooth, and shiny. In fall, they turn various shades of copper, rust, and gold. Through winter, they are deep rust. Buds are long, pointed, and smooth. This hedge branching patterns are smooth, graceful, and lovely. 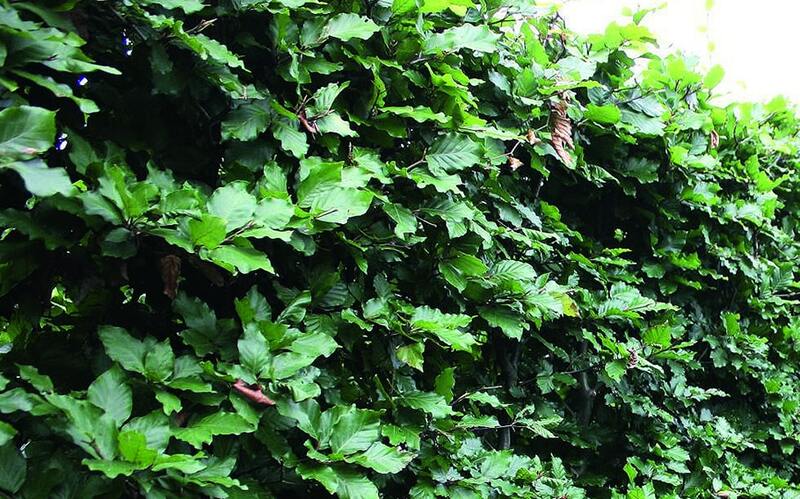 With nothing knobby or angular, Fagus hedge is always elegant. Even if branches are bare (perhaps from an early spring windstorm right before spring flush), they are smooth, silvery, and beautiful. It could be argued that there is not a day in the whole year when this hedge does not look lovely. One huge benefit of choosing a beech tree is that, even though it is deciduous, it provides year-round privacy. After the leaves turn their lovely copper hues in autumn, they fade to the color of rich leather and cling to the branches until just before they flush for spring. Beech flies in the face of the reasoning that you must plant an evergreen hedge for year-round privacy. Photo taken in late February in Oregon – Beech leaves still clinging to the branches! There is perhaps no better example of this than the Meikleour Beech Hedge in Scotland. It was planted in 1745 and is listed in the Guinness Book of World Records as the highest hedge in the world. It was planted as a memorial for fallen soldiers and today is a popular tourist attraction. The hedge is still stunning despite its almost 300 years of age, although at 100 feet tall maintenance has become quite difficult! Although most of us don’t plan to maintain a hedge for more than a few decades, it is interesting to note that this tree can thrive in the same footprint for a very, very long time. 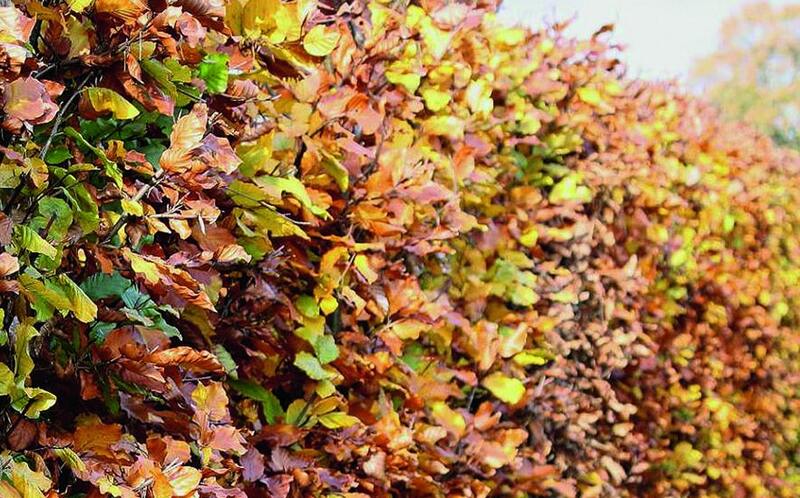 Fagus hedge is one of the few popular hedges that can boast a stunning seasonal color change. First, in spring, leaves are fresh, bright green. For summer, they are deep green, smooth, and shiny. In fall, they turn various shades of copper, rust, and gold. Through winter, they are deep rust. Buds are long, pointed, and smooth. This hedge can be grown in full sun to full shade, making it wonderfully versatile for all kinds of locations. This is especially useful if you are planting a very long hedge that passes through areas with full sun and full shade, as you can use the same type of hedge throughout. The best time to ship and plant beech hedges is in fall, winter, or early spring while still dormant. This puts the least amount of stress on the plants. Beech is tolerant of a wide range of soils, even poor soils. 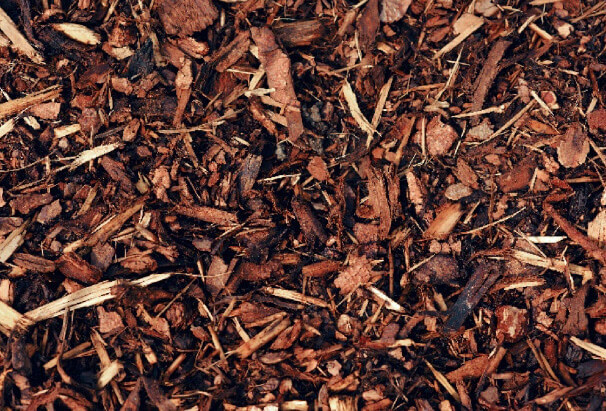 Most roots grow in the upper two feet of the soil, so a generous application of mulch around the base of the hedge will help protect the roots, especially if you are planting in an area with high foot or vehicle traffic. The deepest roots typically reach a maximum of 7 feet. Beech is fairly drought-tolerant but will thrive better if provided ample water in summer. The best time to prune a this hedge is when it is dormant in late fall, winter, or early spring. Beech has a moderate growth rate of 6-12 inches per year, so one yearly pruning should be plenty to keep it shaped and under control. Pruning in summer may cause stress to the plants. Winter is the best time to prune beech hedges, or in late fall or early spring when they are still dormant. Although beech does not thrive in salty coastal climates, it is tolerant of urban pollution and is a great city tree. Beech is an excellent choice for urban plantings as it is tolerant of urban pollution. There are no major pests for beech, and any issues can usually be cleared up without any permanent damage to the plants. Beech are mostly deer-resistant as well. 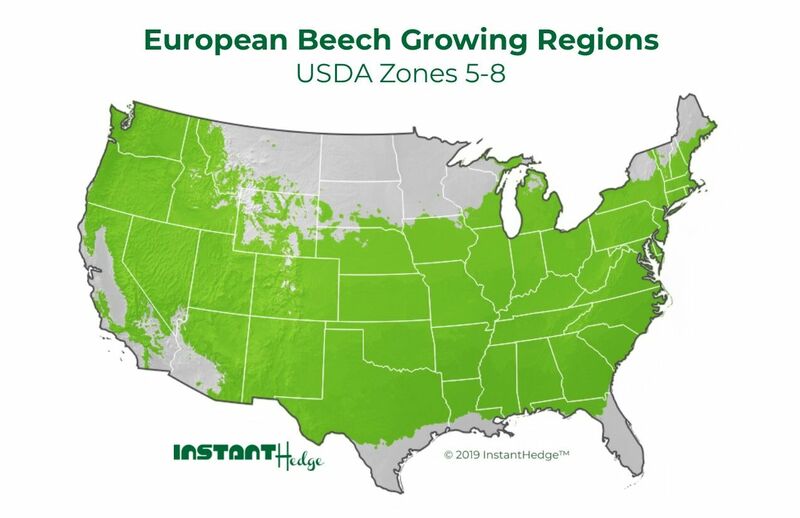 Hardy to USDA Zone 4, beech is a great option for colder areas. Even after going dormant for the season, beech retains its bronze, leathery leaves to keep providing privacy for the rest of the year. Khaki-brown leaves cling to the European beech (Fagus sylvatica) hedges outside this medieval castle. Beech has a brilliant fall color display of gold, orange, and bronze. The use of InstantHedges can create definition between areas of the landscape like in this public garden at an estate. This outdoor dining room is given separation from the rest of the garden by the surrounding beech hedges, but is not tall enough to impede the view or conversations. With the help of an arbor, a European beech (Fagus sylvatica) hedge can be pruned to form a picturesque arch over the path to a residence. The flowers in this garden have even more stunning color when set against the bright green background of a European beech (Fagus sylvatica) hedge. This cottage garden is much more private with the intentional use of European beech (Fagus sylvatica) as a hedge. European beech, while deciduous, provides a lush, green screen from spring to early fall. Create a peaceful, private spot to rest by placing a bench against a tall beech privacy hedge. Purple beech is a unique hedge that is sure to make an impact in any landscape design! The vibrant green leaves on this European beech (Fagus sylvatica) create a marvelous border for this stone path. An open grassy space is transformed to a private seating area with the use of these European beech (Fagus sylvatica) hedges. European beech (Fagus sylvatica) forms an elegant boundary between this garden and the landscape on the other side. This lawn outside a business is made more welcoming with a short European beech (Fagus sylvatica) screen. European beech (Fagus sylvatica) defines the boundaries of this back yard while adding life to the landscape. This European beech (Fagus sylvatica) hedge is used to line a driveway and create a formal entry. Tall beech hedges form a dramatic screen on either side of this path. After many years, European beech (Fagus sylvatica) can be grown to quite a stately wall of bright green foliage! This open space feels more private lined with European beech (Fagus sylvatica). Stunning European beech (Fagus sylvatica) hedge nearing 8' tall.